The world loves an underdog story — and IPAs, White Claws, and costumes. Oh, and also pinball. 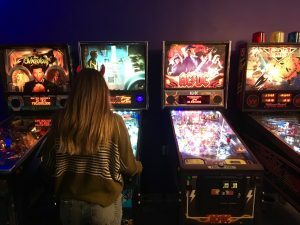 The Richmond Pinball Collective, a non-profit social club, held their first Gal-O-Ween Women’s Pinball Tournament this weekend with players coming from all over the Commonwealth. Also in attendance were members of the Richmond chapter of Belles & Chimes, an international network of women’s pinball leagues. Most players were there to win, some were there to support their league’s event, and others had no idea what they were getting themselves into. Enter Maya Leyden: a junior and physics major at the College of William and Mary — and an underdog contender for Gal-O-Ween. RVA Mag followed Leyden on her quest to win this pinball tournament, but what became clear was that neither of us really had any idea what to expect. Pinball is just a game for fun, right? Figuring she’d just play a couple of rounds and call it a day, we entered the tournament area. 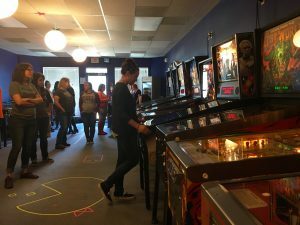 Walking into the Richmond Pinball Collective, Leyden was greeted by Laura Fraley, the club’s president. Standing beside her was the club’s vice president, Clark Fraley, dressed in a pink dragon onesie (amazing). 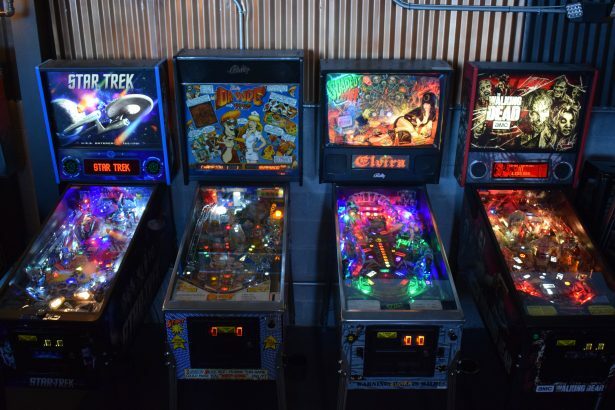 The walls of the Pinball Collective were a deep purple, and lined entirely with pinball machines; sitting conspicuously on the counter were three trophies. “There are trophies? I want one,” said Leyden, determined. We both laughed — Leyden had ever thought about winning a pinball trophy before. Today was her day. While this was a weird blip of a Sunday afternoon, it was a chance to pull back the curtain to peek inside a different world. To others, this was a chance to showcase their skills. The stakes in this tournament vary in degree depending on who you are. If you’re a serious competitor, you’re there to rack up points for your World Pinball Player Rankings (WPPRs). Since this tournament was for women only, the points count toward the players’ women’s world rankings only. 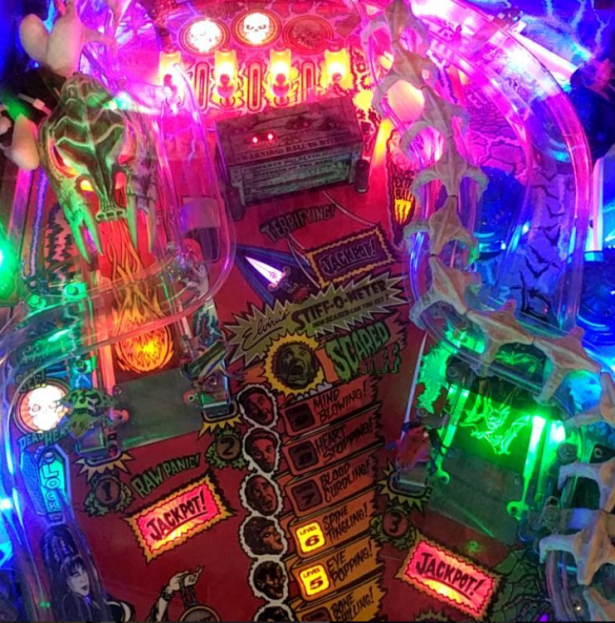 The International Flipper Pinball Association has a player-ranking system for competitive pinball players, with co-ed tournaments awarding regular WPPRs. Fraley, for example, has placed at number eight in an international tournament, and gets ranked accordingly. 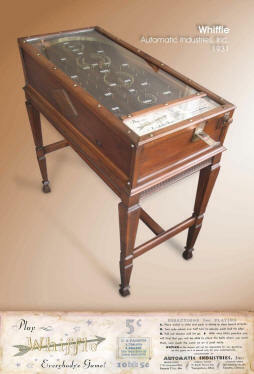 Leyden’s penchant for the game spurs from her father’s love of pinball, and from having two machines in their basement. She knew there were professional pinball players, but didn’t exactly know the extent of the culture surrounding the game — or of that people came just to be spectators and cheer on the tournaments. Players bought beer from the selection of IPAs and White Claws behind the counter. The turnout for this tournament was much higher than expected. “I was thinking 15-20 people,” said Fraley. “We ended up with 24, and that’s about the size of a men and women’s tournament.” Originally stressing about the attendance and event planning, it all paid off in the end. “This is all women in pinball…and I’m melting here, I’m melting,” she said, basking in her success. Fraley explained the rules of the game while Taylor Swift’s “Blank Space” played in the background. The competition was a three-strike tournament with 24 total players. Four players at a time competed at a machine — group knockout style. First- and second-place point-earners were in the safe zone, and third- and fourth-place point-earners received a strike. A player’s third strike disqualified them. The top four players were each awarded a percentage of the tournament registration fees, and the third, second, and first place winners also got one of the neon light-up trophies. In Fraley’s love for the tournament, she paid for the trophies out-of-pocket. The energy in the room was radiating with friendly competition. Players discussed the pros and cons of wearing heels while playing. Some liked to lean down at eye level, while some liked to stand over the play field, seeing it from a bird’s-eye view. One player dressed as Wednesday Addams walked down the line of machines and smiled, “We’re all gonna win!” Other players were dressed as Velma from Scooby Doo, cowgirls, and doctors; Leyden wore devil horns. The overall vibe was about the women competitors, all of whom congratulated each other, shouting,“good ball!,” and shaking their heads with empathy when a round didn’t go so well. “It only takes one ball, one ball,” the players kept repeating to each other. One good ball could solidify your spot in the safe zone. “I feel like that’s how all the all women’s events go, a much more supportive atmosphere,” said Juana Summers, who traveled more than five hours from Baltimore to attend the tournament. Summers and another player, Stephanie Traub, both opted to wear headphones while they played, giving off a more intense aura. For the most part, Traub kept to herself. Summers and Leyden ended up playing a couple rounds against each other, joking around and supporting each other through the process. Others were starting to feel the pressure. Player Christina Turner told me she was nervous. As the tournament progressed, the player pool got smaller. Leyden ended in the top five, without a strike bracket. Walking around the room, I snapped pictures and took in conversations happening around me at the various machines. “She’s astounding,” someone said, pointing to Leyden. Fraley saw me in awe. “Your girl’s doing pretty well,” Fraley said. “Looks like you’ll be here a while.” Summers asked if she’d ever played in a tournament before. Leyden smiled, and told her no. “You’re kidding me!” Summers laughed. The last four competitors were Leyden, Traub, and two women named Caroline Creekman and Sandy Gramling. Fewer machines were lighting up, the bells died down, and the crowd was paying attention. Former players started to shed the more uncomfortable accessories of their costumes, as wigs and spiderwebs were removed. Almost everyone had a beer in their hands. Leyden and Creekman were playing on their first strike, and Gramling and Traub were both playing on their last strike. Being in the top four secured Leyden’s standing in leaving with a cash prize; the neon trophies were actually in her grasp — she never thought she’d make it this far. Creekman and Traub eventually played for first place on a Dirty Harry machine. The crowd was silent, with the only noises coming from the pinball machine. Traub’s earphones were off and sat with her phone a couple machines down — she let a few expletives loose during the game. Winning, she finally cracked a smile — yet the real story was Leyden, a random rookie who just wanted to play a few rounds, and walked away $30 richer. “I want a trophy next time,” said Maya, as we were leaving. Wait — next time? With platforms such as Twitch and constantly changing technology, it is a fact that computer and video games will always be here to stay. However, before we had Mario and Link saving their respective princesses, there was a system that solidified itself for life in the hearts of American gamers. A time of cabinets, a steel ball, plungers, and flippers instead of controllers or headsets. That’s right, I’m talking about pinball. 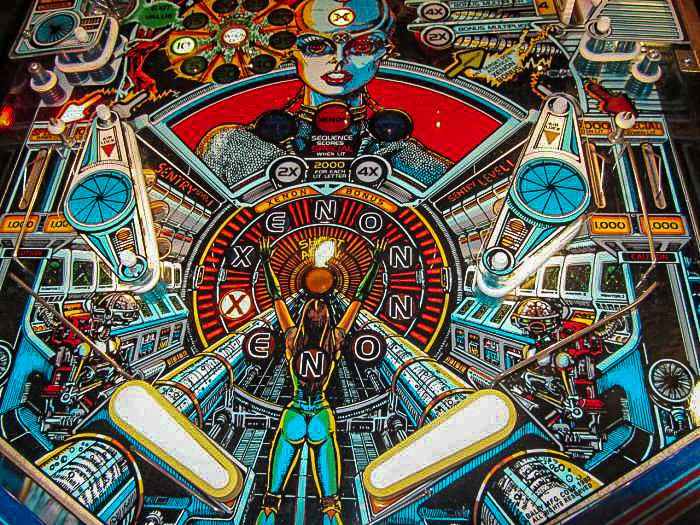 In his latest book, triple threat Adam Ruben weaves together the history of pinball in his new book, Pinball Wizards: Jackpots, Drains, and the Cult of the Silver Ball. Ruben, who will come to Richmond this weekend for a reading, signing, and even a few rounds of pinball, is a comedian, a molecular biologist, and he was at one point ranked 80th in the world for competitive pinball. The author and pinball fanatic examines the war-themed and gambling machines, to the golden era of pinball, why it soar in popularity, its decline, and its resurgence. In Pinball Wizards, Ruben also heads to gaming conventions, museums, and meets with pinball designers and factories to find out what makes these “wizards” so good and how this simple, yet complex game has stood the test of time and garnered a cult-like following. While pinball games as we know them can be seen as far back as the early 1930s when the first coin-operated “pinball machine”, called Whiffle Board, was invented by Automatic Industries, it really became a part of pop culture in the 70s and into the early 80s, known as “the golden age” as arcades began popping up all over America in strip malls, restaurants, and movie theaters. With the introduction of video game consoles, the trend began to fade in the late 80s and early 90s, but lit up again in the last several years with arcade bars opening in Brooklyn, Philly, Los Angeles, and even right here in Richmond. Americans and old school gamers haven’t forgotten about their favorite past time, and it seems its slipping into more and more recent media such as Netflix’s hit Stranger Things which revolves around 1980s American pop culture. But what is bringing this resurgence on recently? We can certainly look at nostalgia marketing such as Stranger Things or how companies such as Nickelodeon and Disney are advertising toward adults who grew up during these eras. Ruben believes companies aren’t getting into for the money that’s for sure, but for the pure love of the game. What makes this go around different than the past is the fact that we are ready to drop money on what reminds us of our childhood, what made us happy. This is why nostalgia capitalism is such a profitable sub-genre right now, and while it might dip a little as with any trend, pinball will ultimately survive. With such a strong foundation to support it, pinball definitely has some sort of solid future ahead of it, although Ruben is understandably hesitant for you to quote him on it. Regardless, he said there could be some extra lives for pinball ahead. Obviously, Ruben has decided on a favorite pinball machine at this point (it’s The Twilight Zone), but the real question I had was how would he design his ultimate machine. He had a few ideas bouncing around. While myself and others are surely looking forward to hearing more about how Ruben used his comedy background to turn his history of America’s greatest game into a fun narrative, he has some more specific hopes for his upcoming event on Sunday. 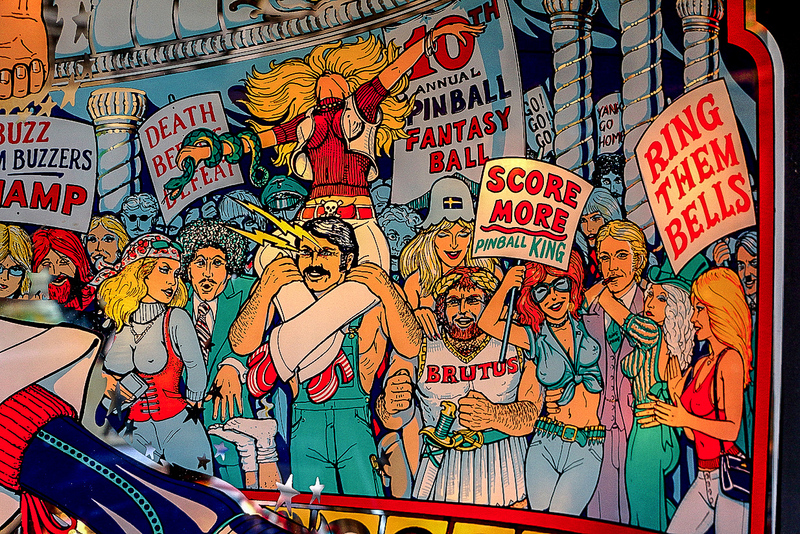 Nostalgia definitely plays a part in keeping the pinball spirit alive and well, but one thing that will always keep those neon lights aglow and the wind up sounds of the machine going is the way it brings people together. Whether you’re young or old, there is something that will never not be satisfying about flinging a steel ball as hard as possible until it hits the back of a box, earning you the highest score and bragging rights as you enter in your initials with your cramping fingers. Ruben will come to the Richmond Pinball Collective, located at 9550 Midlothian Turnpike Unit 112 on Sunday, June 10 for a book signing and reading, from 2-3: 30 pm. Arcade free play will begin at 3:30 pm until 7:30 pm.